SPX finally made its Master Cycle high at 11:30 am at 2791.47, just 10 points shy of its March 13 high. Nevertheless, this counts best as the “top” of Wave . SPX futures put in an overnight high of 2789.00 but have eased down. The decline from the top so far is miniscule, so any (short) positions taken here would be considered to be aggressive. 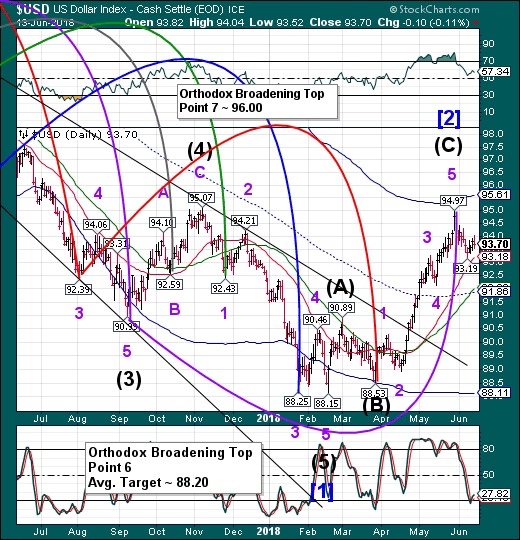 Should the Orthodox Broadening Top be accurate, the next target would be “point 6” near 2570.00. 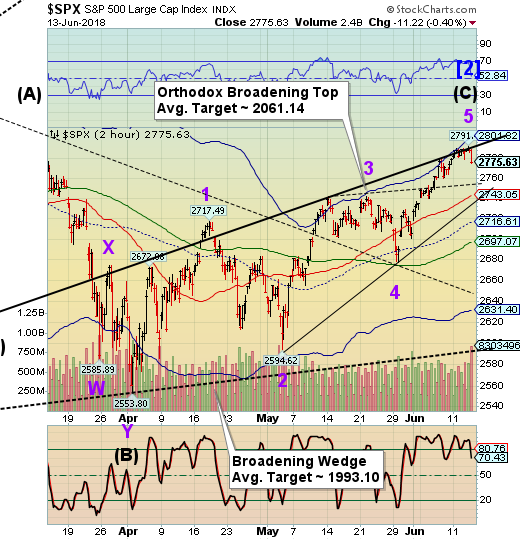 The Ending Diagonal agrees, since a break of the lower trendline near 2740.00 may send the SPX to its target at 2553.80. 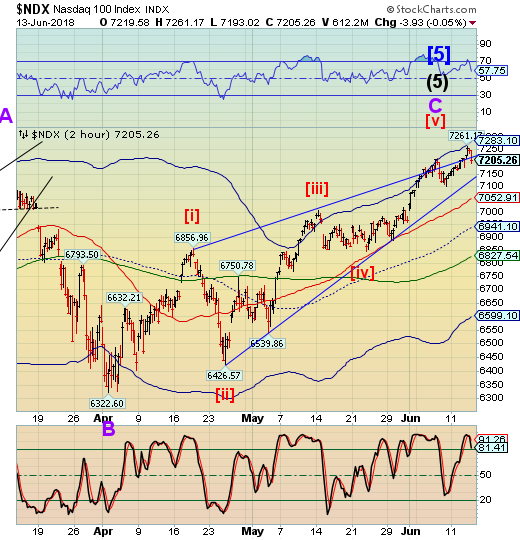 This would give the SPX a clear break of its 200-day Moving Average at 2652.40. ZeroHedge comments, “US futures are flat after a torrid 24 hours, which saw European and Asian stocks decline led by China, HK and South Korea, as weak economic data, a Fed rate hike and U.S. tariff threats spooked emerging markets and sucked the life out of a rally spurred by the Chinese central bank unexpectedly deciding not to follow the Fed in raising interest rates amid what Rabobank said was "shockingly weak" Chinese data as the global economy is now on its last legs. Of course, the looming ECB rate decision, in which Draghi may announce the beginning of the end of QE, is adding another layer of uncertainty (full ECB preview here). NDX futures are modestly higher. The reaction to the ECB announcement is coming in with stocks rising, but yields falling. This is a direct disconnect that needs resolution. Why would stocks celebrate the end European QE? VIX futures are taking a hit by revisiting yesterday’s low. This could be a false flag used to increase long positions by the Commercials. 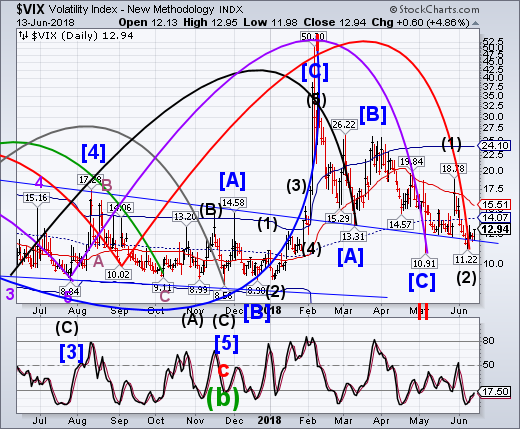 VIX should not go beneath its trendline at 11.95. After a brief skirmish with the 3-handle yesterday, TNX is moving back down after the ECB announcement. Could it be that European investors find US Treasuries to be a “safe haven” or possibly even a bargain? ZeroHedge comments, “In his monthly must-see live webcast this week, DoubleLine CEO Jeffrey Gundlach made one very specific call (among others) that stood out to many listening in on the call. 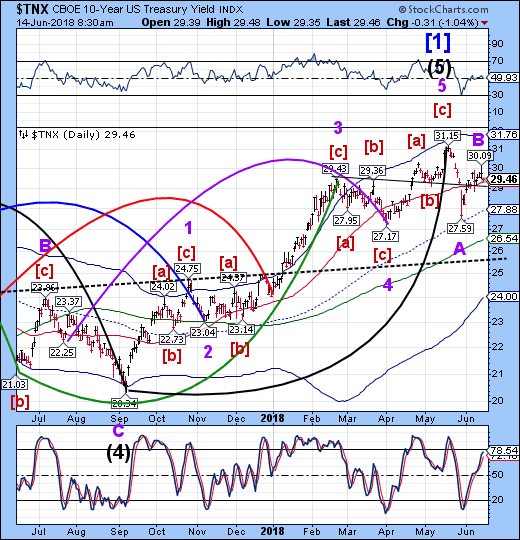 Tony – Ultimately Jeff will be right, but yields don’t go in a straight line. In addition, a Wave  can go an awfully long distance (all the way back to the start of Wave  at 13.36) before a Wave  takes it to 6%. The Commercials may be right in going long bonds. USD futures swung higher this morning, but did not exceed yesterday’s high as I write. The consolidation should end shortly, followed by a probable decline to the next Master Cycle low at the end of the month.